Pocket Size, but Fully Functional, Meet All Your Needs. The MUSTOOL MT108 is a pocket-sized 6000 counts automatic digital instrument. 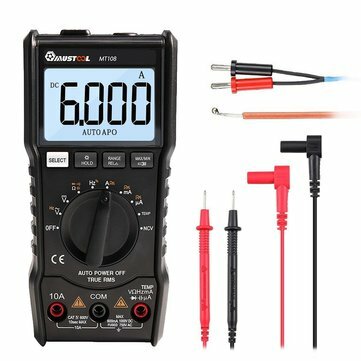 It's a stable performance, high precision, high reliability clear readings, and overload protection. With a large-screen LCD display, boost power supply, even in the 2.3V low battery edge, it can guarantee the backlight high brightness, the table is easy to carry, is a vast number of users extremely like the instrument, the backlight can be bright can be automatically turned off after 15 seconds. It's an ideal tool for the laboratory, factory, radio enthusiasts and families. 35MM x 50MM HD LCD screen display with backlight . Diode 4.2V high voltage output, easy to light the LCD. Overrange display: the most significant bit was "0L"